The Vault Plot command both intrigues and baffles me, often at the same time! The intrigue is that it works so well in running off general user defined plots as well as batch plotting. The baffle comes from the workflow needed to plot (or print) all of the part/assembly documentation files (IDW or DWG) based on the selection of an IAM file as the source. 1 method works but feels clumsy and the other method doesn't work and feels more logical. So to begin with I have found nothing in the help file about Batch Plotting Files that indicates that my required workflow does or doesn't work. There is a rather generic entry that shows that it possible should work. CAD files, Microsoft Office files, text files, and any other file type stored in the vault can be added to a plot list. And that comment probably is correct, just not in the terms of my more logical need. So what is that? Well, it's just to select an IAM file in Vault Explorer, then hit the Plot command and for the Plot Manager to do it's magic and pick all of the related IDW files of the part/assembly files used by the source assembly and Plot them. Simple really. But it doesn't work like that. And that's the reason for the bafflement. To get it to work at plotting all of the related part/assembly IDW files based on a source IAM file you have to hit the Plot command which brings up the Plot Manager window and then Exclude any file you had selected in the Vault Explorer when you instigated the Plot command. Then you add the assembly file by using the Add button in the Plot Manager window and browsing for and selecting the IAM file. 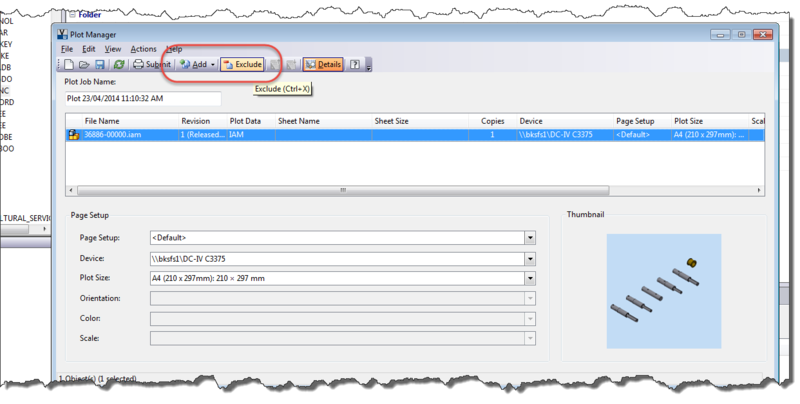 Once the source IAM file is selected hit Open and the Plot Manager will get the IDW files of the parts/assemblies used in the IAM file and present them in the Plot Manager window. Brilliant ain't it? Except I feel it would be more logical and natural to simply select the IAM file in Vault Explorer, hit the PLOT command and it does the same thing. It goes and gets the related part/assembly file IDW's used by the source assembly and adds them tot he Plot Manager window. Currently it will run off picture (like a screen capture) of the IAM but from a strange viewpoint. Below is a video with audio of the above steps in action. I apologise for the quality of the audio. It's my first attempt at it and I had the microphone level wrong. So turn up your volume if you want to hear my speech. Also, here is a link to an IdeaStation entry I made to promote the "plot from IAM file" idea I have. Vote for it if you think it has merit.